Telemedicine Expands, Though Financial Prospects Still Uncertain : Shots - Health News With apps and video chats now a part of many people's days, some firms and hospitals see big potential for health care delivered remotely. But a lot of insurers still aren't willing to pay for it. 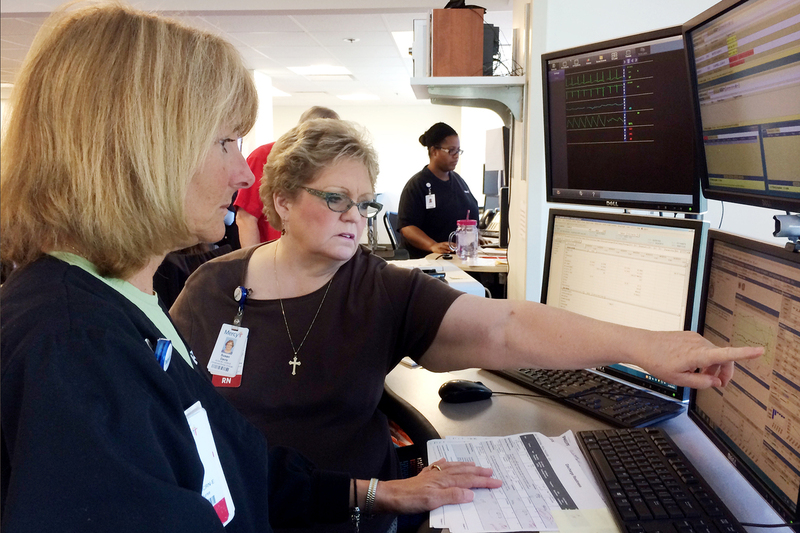 Nurses Patricia Wegener (left) and Susan Davis at Mercy Hospital can monitor the condition of a patient who is miles away via the hospital's technology. But some health insurers and analysts remain skeptical that telemedicine saves money. Say you're a Midwestern farmer in a hospital bed, recovering from surgery or a major illness. It's time for the nurse's check-in, but there's no knock on the door. "Good afternoon, this is Jeff with SafeWatch," the smiling face says. "Just doing my afternoon rounds." It's a little hard to shake the Jetsons vibe in this telemedicine training exercise, but this kind of health care isn't just futuristic; it's happening now and expanding. On Oct. 6, Mercy Hospital will open its new telemedicine mothership. The idea isn't so much to keep closer track of patients at the St. Louis hospital, as to treat thousands of patients spread across five states. "You can monitor their heart, their blood pressure, their respiratory rate, their temperature on a 24/7 basis," he says. "You can monitor their position — so you can tell if they've been out of bed. You can tell if they've turned in bed." He says the quality of telemedicine can be high, and it's cheaper than in-person care. Hale and his team now largely provide care for patients in rural areas, but the use of their system may soon extend quickly to a different group of patients: baby boomers anywhere who want to stay in their homes instead of moving to a nursing facility when their need for health care increases. "Coverage will be expanded to include more physicians and more specialties and also a range of communications," Turk says. "So instead of it being only interactive video consultation, it could be text messaging as well." Still, the telemedicine boom faces some big challenges, she says. Many insurance companies have been slow to pay for these services. Medicare, the largest health insurer for Americans over 65, is a financial powerhouse; insurance companies often follow Medicare's lead in determining which treatments and procedures they'll cover. Right now, Medicare only covers the use of telemedicine in rural or medically underserved areas, and only when video conferencing is used. But telemedicine has broadened as the technology has developed. Now that doctors and nurses could use a smartphone app to, say, monitor their patient's falls in the home, insurance companies and Medicare need to rethink their payment criteria, proponents say. "If telemedicine really saved money, payers would be falling over themselves paying for this stuff, right?" Jha points out. "Because it would actually benefit their bottom line." Telemedicine does seem to provide good access to quality medical care, he says. But even though it could save money, that's not what's happening. "It tends to be an addition," he explains. "You do the telemedicine; it leads to more tests. It leads to more follow-up visits. And, over time, when you look at the data, it turns out that telemedicine overall is not necessarily a big cost saver."